Dating. Friendships. Work life balance. It's tough to be a young woman in the city, especially when you can fly. 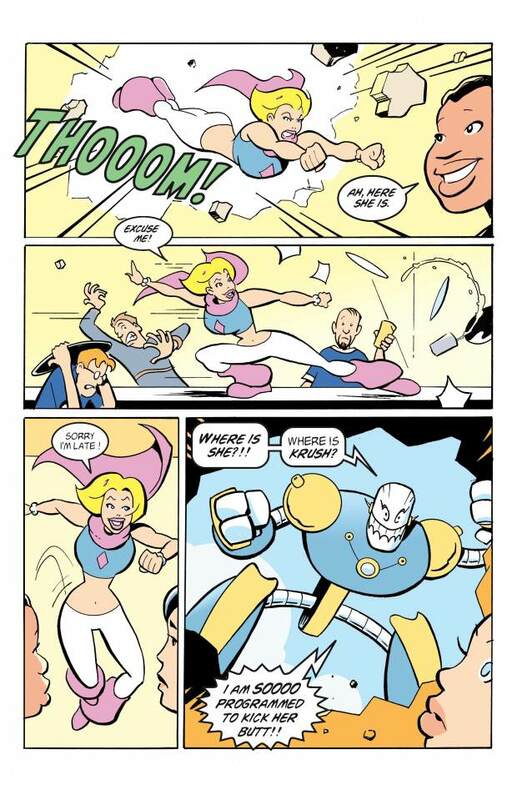 Can the the all-girl superteam BOOM!SQUAD protect their hometown from menacing corporate powerhouse Mr. Goode? Will their boyfriends, a trio of musicians playing in the city's worst rock and roll band, cause more problems than their worth? And where can a girl find a good latte without having to go to a corporate coffee chain? Boom!Squad is an 80 page color graphic novel with something fun for comic readers young and old. Discover an engaging superhero tale with dynamic artwork, sharp dialogue, and just a hint of self-consciousness. Fans of genre-busting creators like Mike Allred, Brian Vaughan, Daniel Clowes, Matt Groening and the Hernandez brothers will love this witty and wild story of superpowered young women. David Crouseis a writer with complex tastes. He loves Virginia Woolf, Gabriel Garcia Marquez, bad science fiction and horror movies, and (of course) comic books. His short story collection Copy Catswon the Flannery O’Connor award for Short Fiction and was nominated for the Pen-Faulkner. His second collection of short stories,The Man Back There, won the Mary McCarthy Prize and was published by Sarabande books. His comic book writing has been published in the horror anthologyThe Dark Horse Book of the Dead. He's currently writing a novel about vampires and academia and a short story collection about interior Alaska. He lives in Seattle, Washington. Greg Moutafishas illustrated a variety of projects for publishers including Cengage Learning, Topps, Jetpack Press, Children's Hospital Boston, Lollipop music magazine and the Boston Comics Roundtable. He has worked on numerous indie comic projects including Boston's groundbreaking comics anthology Don't Shoot It's Only Comix and was the winner of a Xeric Grant for the underground comic Killer Ape. Full Color Paperback Printing. It's a gorgeous, colorful tale and we want to share a great looking printed book with generations of readers and collectors. Barcoding. Official ISBN numbering improves US distribution and cataloging. You will receive a multitude of items: a copy of the Boom!Squad Graphic Novel signed by David, a signed copy of his first award-winning collection of short stories, Copy Cats, and a signed copy of his second collection of short fiction, The Man Back There. You will also receive another extra special item: one of David's early notebook sketches from the original planning stages of the comic! He'll sign that too while he's at it. Free US shipping for this perk. You receive this early concept ink drawing by Greg, featuring characters Krush and Wick against the stylish nighttime backdrop of their hometurf: Boomtown. Original 8.5x11" signed art will be shipped to you. Perk includes 1 paperback book and 1 digital PDF. Free shipping. You will be featured as a character in a comic art style pinup illustrated by Greg. You'll be standing right alongside (or in back of) member(s) of Boom!Squad. And maybe you'll even get a costume - your choice. Original black and white ink art will be shipped to you. You will receive 2 copies of the paperback book and digital PDF. Free shipping.